ANWR photo, Beaufort Sea, Arctic ocean, the Arctic National Wildlife Refuge. The Beaufort Sea along the coastal plain of the Arctic National Wildlife Refuge (ANWR). The Arctic Ocean sea ocean, after spring breakup, rests on the beach. 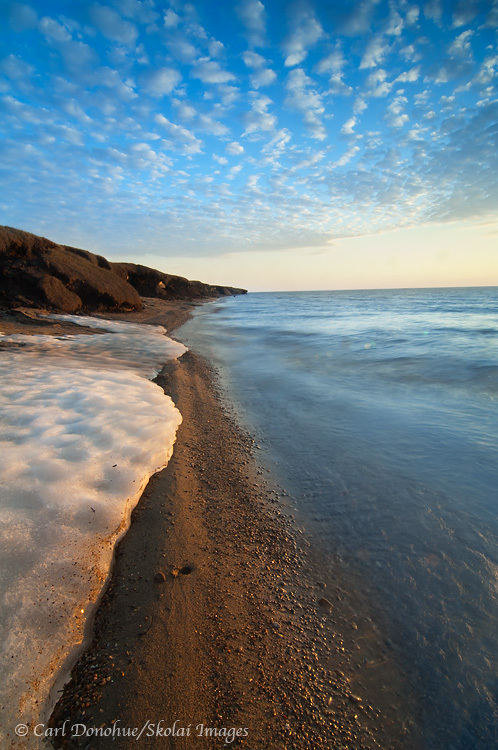 Melting permafrost in the bluffs signals warming temperatures. Arctic Ocean, Coastal Plain, ANWR, Alaska. Click for a larger photo. Another photo from our recent trip to the Arctic National Wildlife Refuge and the Beaufort Sea. I hiked from our final camp across the coastal plain (well, across part of the plain, not the whole thing) with Steve Weaver hoping to photograph some of the icebergs we’d seen the previous day along the shoreline. Unfortunately, strong southerly winds had blown almost all the ice out to sea, and we were largely thwarted. This patch of ice, however, had been resting on shore, stranded when the tide rolled out, and we made a few images. Coastlines are such dynamic landscapes, and in the Arctic particularly so. They can change drastically in a day or less, and do so frequently. This photo was taken around 1:15am .. maybe later. I think Steve and I arrived back at camp around 4:00am, and I went to bed at nearly 5:00am. up at 10:00am-ish to break camp, roll the raft, and wait for a bush plane. We arrived, finally, in Coldfoot, around 5:30pm,(the temp was 90deg F, a start contrast from the Arctic Ocean we’d just left) unpacked the gear from the plane, sorted it and loaded the van, ate dinner, and hit the road, rolling into the Yukon River area stop late at night. Then up early the next morning to drive from there to Anchorage. 36 hours later it was out the door to pick up folks for the next trip to Wrangell – St. Elias National Park and Preserve. Summertime can be like that in Alaska. I’ve been out to the Beaufort Sea here a number of times, now every time I’ve been so fortunate as to have an absolutely glorious final evening. The wind wasn’t bad at all, the bugs had quieted down, and the expansive vastness of the place really moves me. It’s a fantastic experience, to see such a harsh and rugged environment also be so sensitively fragile; the quiet tundra, the shorebirds, a whisper of air and the glowing rays of the sun, low on the horizon. After the trek back to camp I simply couldn’t go to bed, but sat for nearly 45 minutes by my tent, just watching, listening and enjoying the grace of the Arctic coastal plain. It’s a phenomenal place. The bluffs on the left of the frame, like Castles Made of Sand, slowly slip into the sea – eventually. This entry was posted in Adventures, Alaska, ANWR, Cool stories, Environmental Issues, Landscapes, Musings, Rafting and tagged ANWR, Arctic, arctic ocean, Beaufort Sea, Landscapes, scenics, Wildlife on August 1, 2010 by Carl D.
Nice blues in that one, good composition too. Sounds like a hectic, sleep deprived but well worthwhile journey. Glad you are up there capturing the beauty for all to understand it is worth saving. Seeing that shot makes me wish we would have traveled all the way to the coast. Nice light and clouds and some left over snow/ice to boot. Did you shoot any of the shore lapping water, or was it pretty calm out there. The wind seems to howl, usually, on that edge. Thanks for the note. I’m glad Steve had a good time – it was a fun trip. Yeah, it’s worth the effort to go to the coast – definitely, though very few people do. The water was lapping the shore, I used a polarizer to ease the splash .. I probably should’ve shot it with and without. Thanks for the kind words, I appreciate it. The Refuge is a treat to visit, for sure; I have a blast every time we go up there. Wow Carl. You sure get around. Are you usually driving around Alaska to get to places like ANWR or do you fly? Thanks man. The Ocean is simply amazing – changes so drastically from moment to moment. I can’t imagine it in the winter.